The George Washington University Writing Center is a welcoming, professional and academic environment where members of the GW community can receive dedicated attention to their writing and research projects at all stages of the writing process. Our trained writing consultants work with writers from the first-year college experience up through post-doctorate and faculty levels in one-to-one, collaborative conversation, as well as providing specialized workshops and group tutoring opportunities. Undergraduate, graduate, and faculty consultants represent a broad multidisciplinary range of study and expertise and can work with writers from the very early stages of brainstorming through drafting and revising, all the way to polishing for publication. Rather than providing proofreading and editing, the Writing Center works to help the people who come through our doors strengthen their abilities as writers and to become stronger editors of their own work. 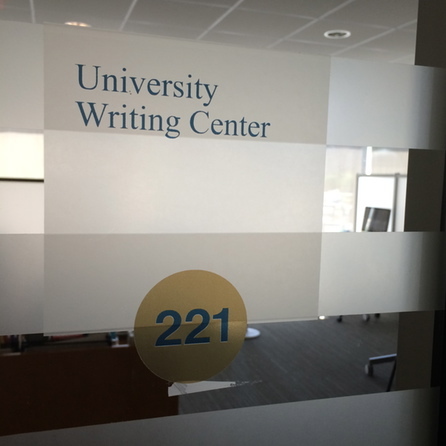 The University Writing Center has four satellite locations in addition to our main center at Gelman Library: Himmelfarb Library, Eckles Library on the Mount Vernon campus, Innovation Hall on the Ashburn Campus, and the Multicultural Student Services Center. All writing consultation conferences are free to members of the GW community. Although appointments are not required and drop-ins are welcome, we do recommend that you reserve a time slot as the Writing Center's appointments do tend to fill up quickly. Schedule an appointment online!